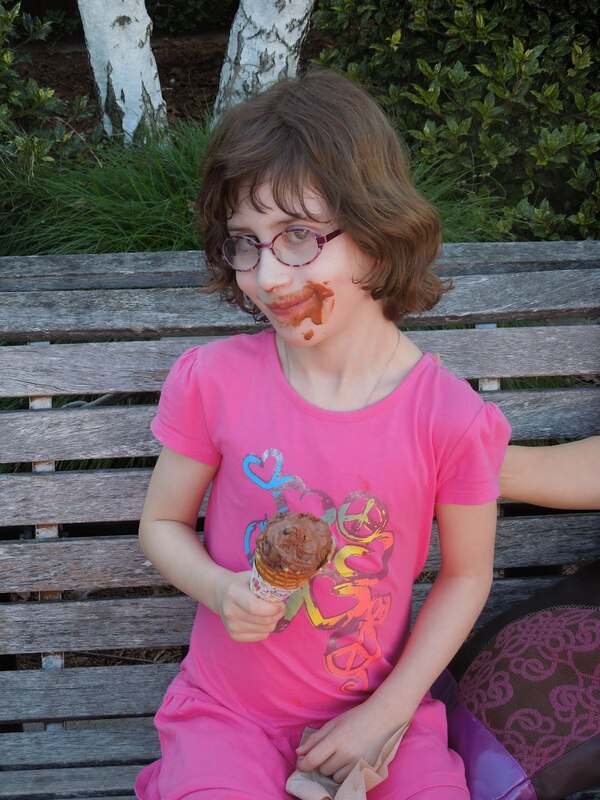 Some of the ice cream actually gets in her, too!! It’s been a long time since I wrote about Charlotte and food. But it recently occurred to me that it has been more than 4 years since we had to connect the tube to her tummy and set up the Kangaroo machine, more than 4 years since we’ve dealt with projectile vomiting, medical supply delivery, and the associated anxiety of not being able to nourish our kiddo. It’s been almost 4 years since we stopped logging calories and about 3 or so since we stopped consciously counting calories. Charlotte eats. And eats. And eats. Occasionally the sheer quantity of what she eats astounds us: This morning’s breakfast began with a toaster waffle, yogurt, and fruit. Then she had an English muffin. Then another toaster waffle. For lunch, she ate two helpings of butter chicken and half a naan at an Indian buffet, followed by chocolate brownie ice cream. On Saturday, while other children were eating hot dogs (Kobe beef on brioche, it must be said), Charlotte was slurping up New England clam chowder and Rhode Island calamari (spicy). She is adventurous with food, able to find something she’ll eat on just about any restaurant menu. And, of course, some old standards like PB&J, nutella sandwiches, mac & cheese (especially from Panera). We’re actually surprised she likes these last few things as she ate them pureed and over-loaded when we had to create extra-high calorie food for her. Here’s the thing: Charlotte was tube-fed to SAVE her life. She had been diagnosed with “failure to thrive.” Post-heart surgery she didn’t have the strength to eat enough. After five months of an NG-tube, her little baby cheeks were ravaged by the tape we used to hold it on her face. She managed to pull the tube out. And even at five months, she hated that NG-tube so much that she managed to prevent it from being inserted. It was heart-breaking, but necessary. We “decided” to have a G-tube surgically inserted to save her from the trauma of the NG-tube. It was one of the best decisions we’ve ever made. So, you can imagine my reaction when I read the New York Times‘s piece, “Bridal Hunger Games” last Sunday. If you didn’t see it, here’s the gist: There are women so obsessed by being thin for their wedding day that they are willing to voluntarily have an NG-tube shoved down their nose into their stomach to provide only liquid nutrition. This “diet” allows them to lose weight fast. One woman lost weight too fast, so she took it out early. My heart does NOT break for her. And, there are doctors who are willing to use this life-saving technology to aid and abet these brides. I’m not sure if this is an extreme form of narcissism or a seriously warped view of beauty norms. Whichever it is, I was beyond appalled. As a critic of popular culture, I plan to step back and look at how this reality (and the reality shows about losing weight) line up with/contrast the new fat-as-normal of shows like “Mike and Molly”. What do these cultural phenomena say about beauty norms in the 21st century? As a mom, I need to figure out what I can do to help my child grow up with a positive body image? Right now, I don’t know the answer to either question. But, I’m fuming a bit less about what that article reports. And, I am still kvelling about all that Charlotte will eat. Isn't it great when they eat? I've been shocked by Oliver's appetite in the last year as well. He didn't have as much of a struggle as Charlotte did (by your account), but I still marvel that I no longer have to wait until he is sleeping to "sneak" food into him.